Those individuals who like working with metal and fire will be interested in becoming a welder. This career is absolutely rewarding and, moreover, there is plenty of job options. To become a welder, you need to complete your training and we’ve made a list of welding schools for you. Also, learn some other useful facts about this job. 4 Where Can Certified Welders Work in Michigan? In simple words, it’s a process of connecting metal pieces. The truth is that it only sounds simple but in reality, you should be able to use numerous tool to heat and melt metal. It means that you need some specific skills and knowledge. If you still doubt about becoming a welder, you should know that this career is absolutely rewarding. Various constructions such as buildings and bridges made by you will be seen for a significant period of time. Also, you’ll have an opportunity to work on open air. Each your project will be made by your own hands. Finally, there is an impressive outcome for welders. Until 2026 the number of jobs in this sphere will increase by 6%. Welders in Michigan have an average median salary of $38 400 per year ($18.46 per hour). It’s a little bit lower than a median salary throughout the country which is $39 390 per year ($18.94 per hour). The top 10% of welders in Michigan earn about $55 290 per year. At the same time, the top 10% of welders throughout the USA have a salary of $62 100 annually. Where Can Certified Welders Work in Michigan? 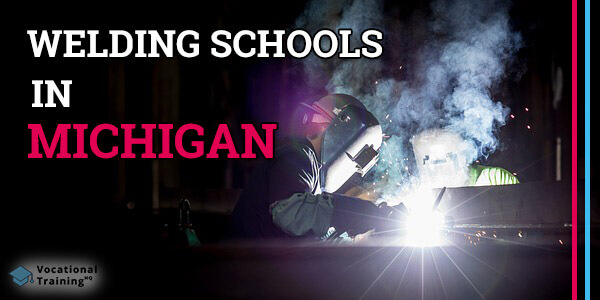 Below there is a list of the best welding certification schools in Michigan. There are 55 schools that were approved by the American Welding Society’s SENSE Accreditation Program.